Your offering last week empowered ministry within our congregation and in response to the needs of our community. It also supported the work of our Commission on Religion and Race (GCORR), working to help us all live in our multicultural world in a way that reflects the love of Christ. 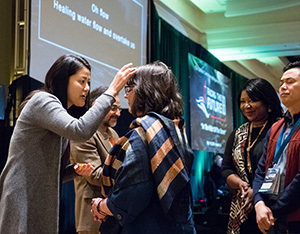 GCORR provides a variety of training opportunities across The United Methodist Church. One example is training for crossracial, crosscultural (CR/CC) appointments. “CR/CC appointments are made as a creative response to increasing racial and ethnic diversity in the church and its leadership. CR/CC appointments are appointments of clergypersons to congregations in which the majority of their constituencies are different from the clergyperson’s own racial/ethnic and cultural background” (Book of Discipline 2016, para.425.4); This ministry happens, thanks to the way the people of The United Methodist Church live and give connectionally. I invite you to give generously as we worship God through sharing our gifts, tithes, and offerings. Note: The following prayers relate to lectionary texts selected for use in Discipleship Ministries’ worship resources.